Are you using YouTube to promote your business, your website/blog, or simply to raise your personal profile? YouTube is a great promotional platform with a huge userbase of over 1 billion subscribers. And they watch billions of videos every day about every possible subject you can think of. So if you’re using YouTube to promote your business, or thinking of trying out the popular social network, you’re in the right place. In this post, I’m going to share 5 top YouTube tips and tricks that will help you grow your channel. At the end of the day, YouTube is a social network. With a focus on the “social” that means in order to grow your channel, you need to engage your fans and subscribers. And respond to the comments you get in a timely manner. You can use your videos and your video descriptions to ask your audience questions. And to give them reasons to want to engage with you. And when they do respond, you can use a social media management tool like Agorapulse to help you manage all of your comments more easily and quickly. Ideally, like with other social networks, you should strive to respond to comments as soon as possible, as this is the best way to get a conversation going. Plus, if you get any negative comments, you don’t want them left unanswered for too long, for others to see. Use it to pre-moderate your comments and see all of them in one place. As well as respond to them from within the same dashboard to make things easier for you. 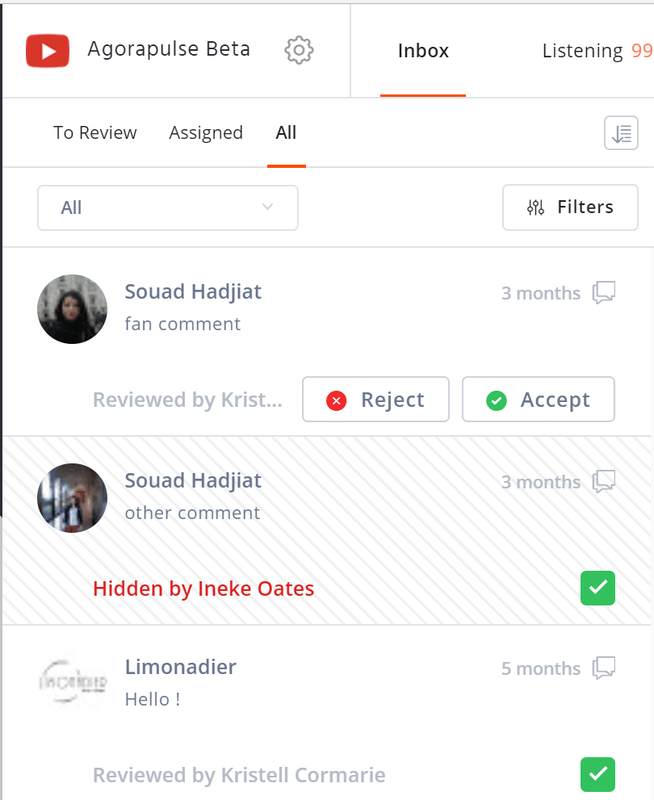 Plus, you also have the ability to collaborate with other users on your YouTube marketing and you can monitor your name across videos and comments. Another way to boost your YouTube engagement — which has a direct effect on your channels’ success — is to leverage the Community tab. Here, you can post content just like you would on Facebook or Twitter, for example, in order to engage your audience (both subscribers and non-subscribers). Use the opportunity to post all kinds of engaging content. Like a behind-the-scenes image from your latest filming experience. Or maybe a GIF promoting your upcoming video. Or, like Evan Carmichael does in the screenshot above, poll your audience to increase their involvement and engagement. Make sure to also tell your audience about your Community tab. You can post a video about it where you talk about your new community tab and tell people to check it out. Don’t forget to mention it in the video description, too. And you can also promote it on your other digital channels. Custom thumbnails take minutes (even seconds once you have a template set up!) to create. And they can make a world of difference to your success on YouTube. You’ll find a large selection of different templates and styles to help you get started. All you have to do is customize the thumbnail to your liking. Make sure it’s in line with your branding in terms of the colors used and try to use eye-catching design elements and colors. And, of course, don’t forget to include some text that tells the viewer what the video is about. Create a Posting Schedule — And Stick to It! It’s very difficult to grow a channel if you’re not posting new content consistently — and frequently. Not only do you get to reach more people the more videos you have, but your subscribers will know exactly when to expect a new video from you. It can be quite time-consuming to produce this much content on a constant basis. But you can use video marketing tools to help, instead of filming and editing everything yourself. For example, tools like Slidely and Wave have huge libraries of millions of stock video clips. Which you can use to edit together compelling live-action videos. You can also add text and other design elements, add music and voiceover, and watermark your videos. Or, if you want to diversify your video content with other formats, you can use tools like Vyond and Powtoon to create animated videos. And no, you don’t need to know anything about animating or video editing to create your own animation. Google might be the king when it comes to search engines, but YouTube is up there with the best of them. After all, it’s the second most popular website in the world as of May 2018, with hundreds of millions of people using it on a daily basis. And they are actively searching for videos so you need to make sure that they can find yours too. There are several important elements that factor into YouTube video optimization. Some of the most important ones though, are the keywords and tags you use. Just like you would with blog posts, use relevant keywords in your headlines and video descriptions and add relevant tags to every video you post. 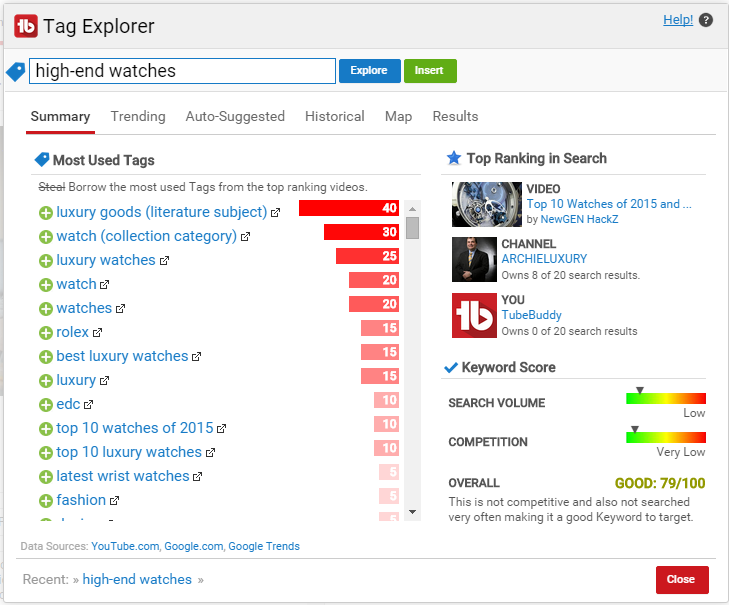 Find out what keywords and tags your competitors are using successfully in their videos (or any YouTube video). Get tag suggestions as you type your video description and headline. Find the most used tags for any topic/niche. Other elements that count towards your ranking and will help boost your SEO are engagement and subscriber numbers. That’s why it’s doubly important to encourage your audience to engage with you and leave comments, as well as to subscribe to your channel. In terms of subscriber numbers, YouTube doesn’t just care about how many subscribers you have. After all, that would mean you would only see results from the biggest channels. YouTube also looks at how many subscribers you get after viewing one of your videos. YouTube uses these stats — subscribers and engagement — to measure the quality of your videos and your channel. 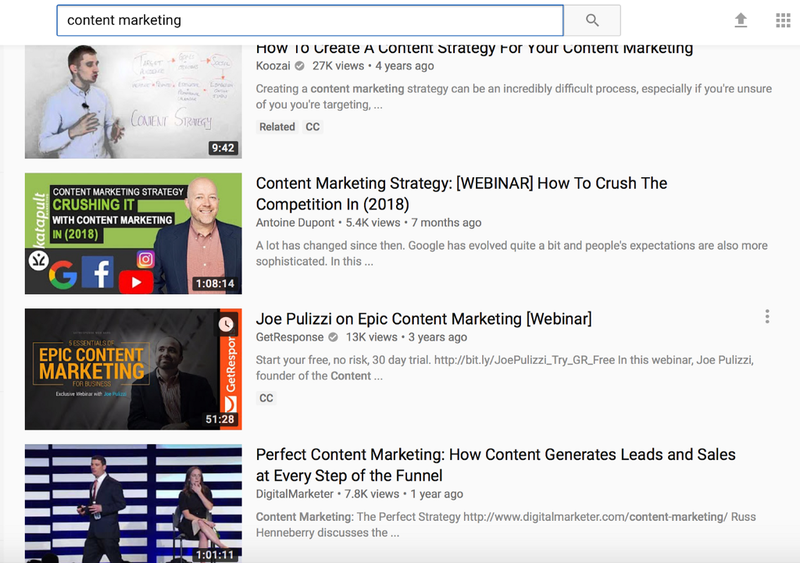 If your videos make people want to share them out, leave a comment, and/or subscribe to your channel, that means your videos are good enough to pop up higher up in people’s search results. YouTube can be a very powerful tool when it comes to growing your business, your website, or your personal profile as an influencer or thought leader in your niche. All you need to do is create great content consistently, engage your audience, and leverage different features and tools that you have at your disposal. Are you using YouTube to promote your business or website? Do you have any tips to add? Please share your experiences and insights in the comments below. Shane Barker is the Founder and CEO of Content Solutions and Gifographics. You can connect with him on Twitter, Facebook, LinkedIn, YouTube, and Instagram. 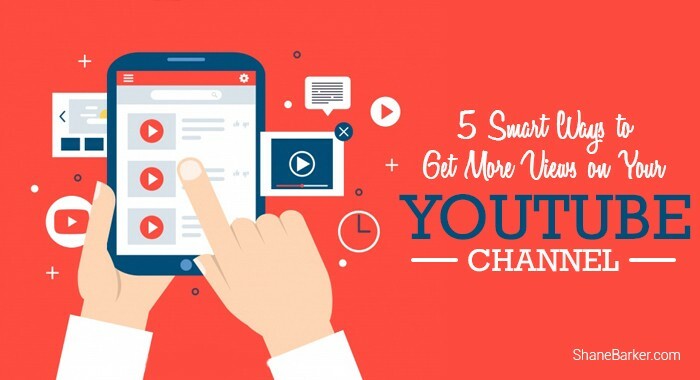 5 Smart Ways to Get More Views on Your YouTube Channel was originally published in Marketing And Growth Hacking on Medium, where people are continuing the conversation by highlighting and responding to this story. Biz Tips: What Are You Looking For in a Content Marketing Specialist?